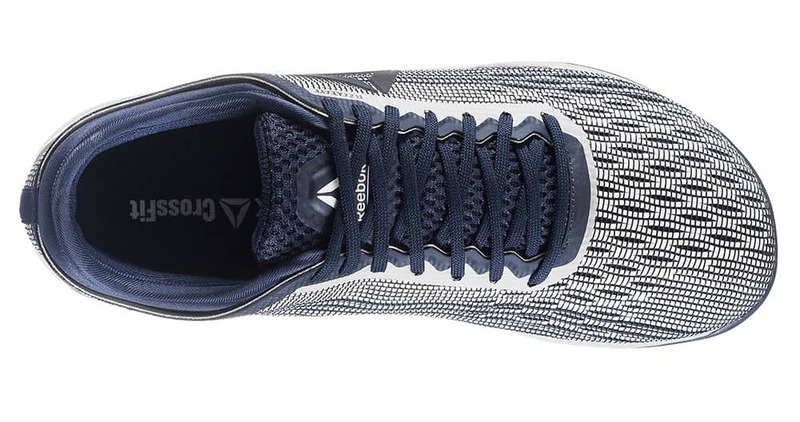 The Reebok CrossFit Nano 8 Flexweave is the newest version of the Nano CrossFit training shoe from Reebok. 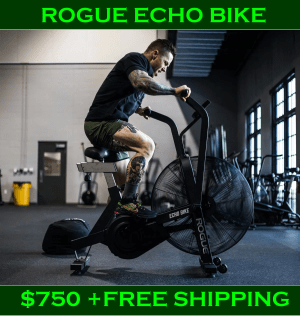 It’s designed for all the demands of the WOD – heavy weight lifting, short runs, jumps, rope climbs, or just about anything else. 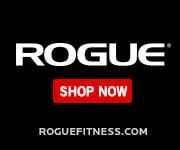 It’s now available to order online from Rogue Fitness. When will the Nano 9 Cross Training Shoe be Released? Reebok hasn’t announced when the Nano 9 training shoe will be released. 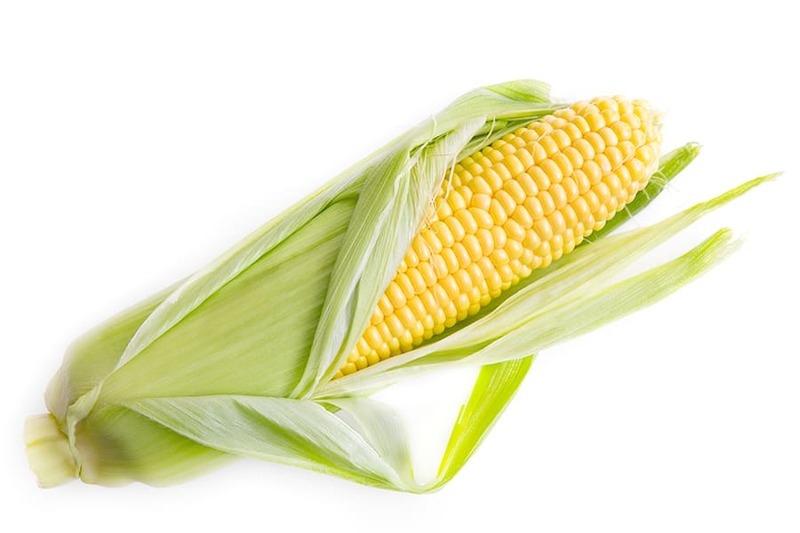 It is believed one is under development and that it may be released in mid-2019. 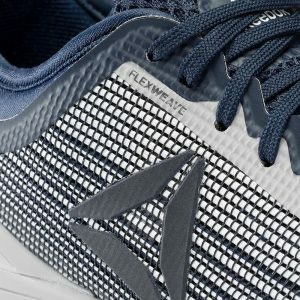 We believe it will be released before the CrossFit Games 2019 in August – which means the shoe could be released any day now. 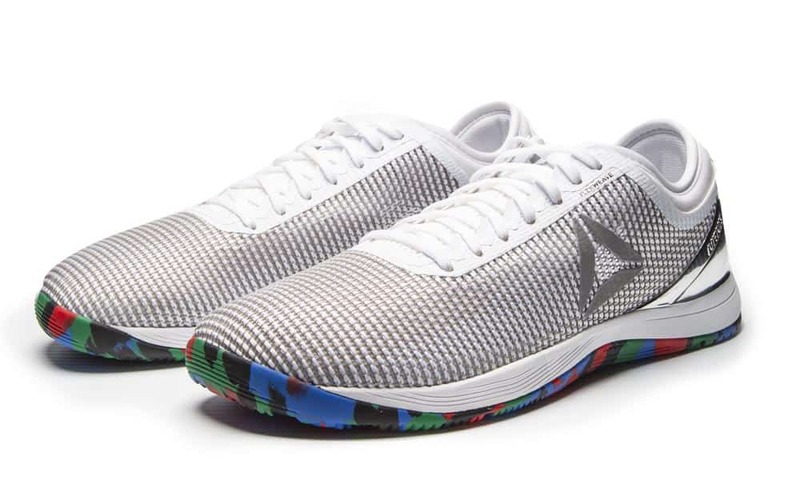 Morning Chalk Up (Which is an awesome daily email you should subscribe to if you like CrossFit) confirms that the Nano 9.0 is in the works – and being reviewed during the Reebok Athlete Summit which happened recently. We’ll share more information when we have it. 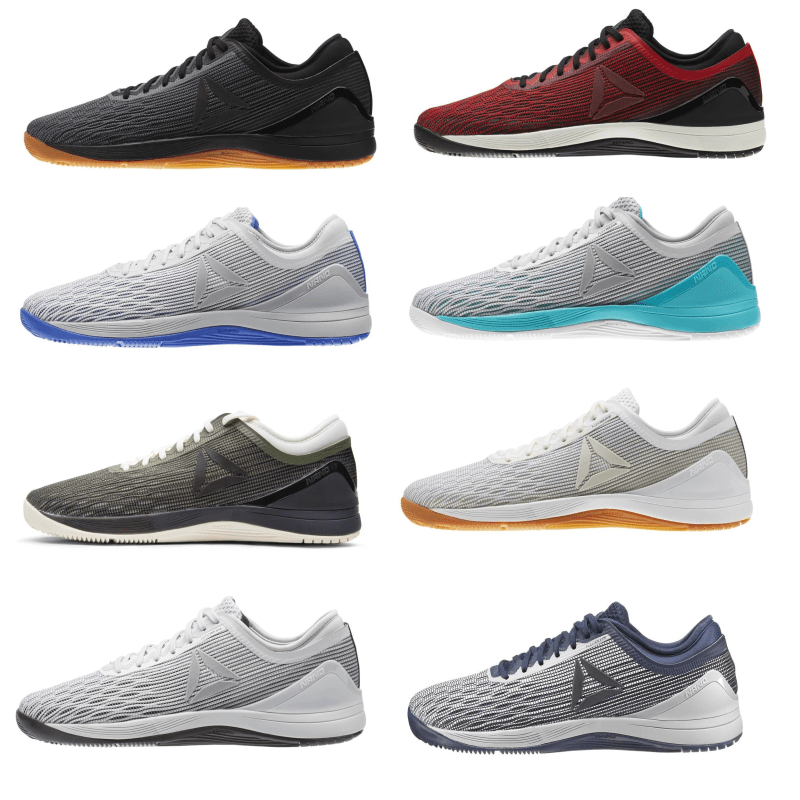 A lot of the great features of the previous shoe, the Nano 7 and Nano 6, are carried over to the new model. But there’s a multitude of improvements too – especially in comfort and versatility. 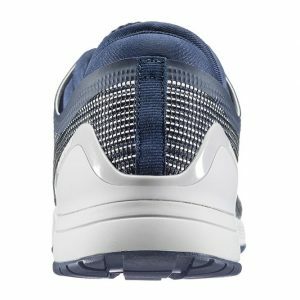 The newest innovation is the extensive use of Reebok’s Flexweave material which provides lightweight support, breathability, and durability. Reebok CrossFit Nano 4.0 A classic returns – for a limited time Reebok has made the Nano 4.0 available again. Be sure to check these out while you can. Take a look at the closeup above of the Nano 8. Flexweave is an innovative figure-8 weave that can interlock individual fibers. Thanks to Flexweave, the upper is a single-layer while still providing a supportive, controlled fit with higher and lower density zones – for durability and flexibility – precisely where it’s needed. In a versatile training shoe you need some areas to be rigid – and some to be flexible. At the same time you want the shoes to be light and breathable. Flexweave helps accomplish that. 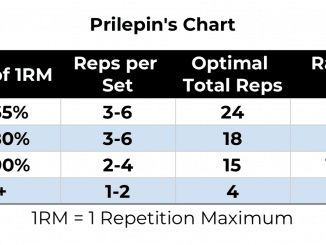 CrossFit WODs involve a lot of weightlifting – and heavy weights at that. The critical barbell exercises of a typical WOD require a proper shoe. 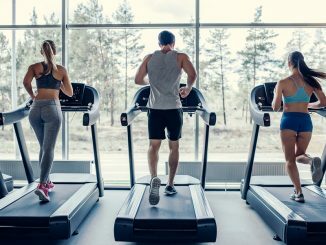 Running shoes are not good for this purpose – they have too much cushioning and compressibility in the outsole. The last thing you want with a big weight overhead or on your shoulders is to have your feet sinking into the mushy sole of a running shoe – it’s an injury waiting to happen but it’s also a loss of efficiency. The Nano 8 line is “low-profile”. The heel is fairly rigid and the shoe has a minimal “drop” – the difference in height from the heel to the toe is only 4mm. This means the shoe has the the secure footing and stability you need for lifting big weight. 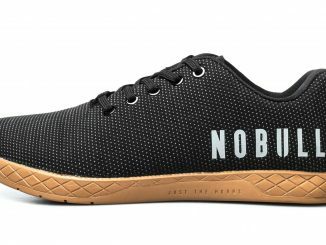 But unlike single purpose weightlifting shoes which are too heavy and too rigid for rapid movement – you can do a whole lot more in your Nanos – like jump, run, cut, or rope climb. 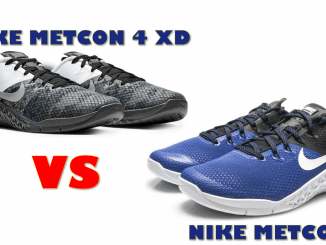 Nike Metcon 4 vs Reebok Nano 8 The Nike Metcon 4 is Nike’s cross training shoe – also new for 2018. 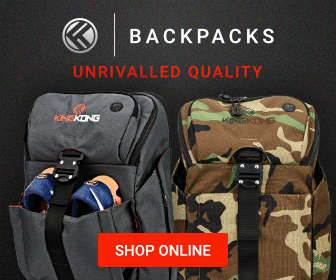 It is similar in many respects – it’s light, breathable, and meant for the rigors of both heavy weights and explosive and quick WOD movements. It’s also got a 4mm low-profile drop and is constructed of light-weight, breathable material. Either shoe is going to be an excellent choice – and which one you prefer may come down to styling and aesthetics. 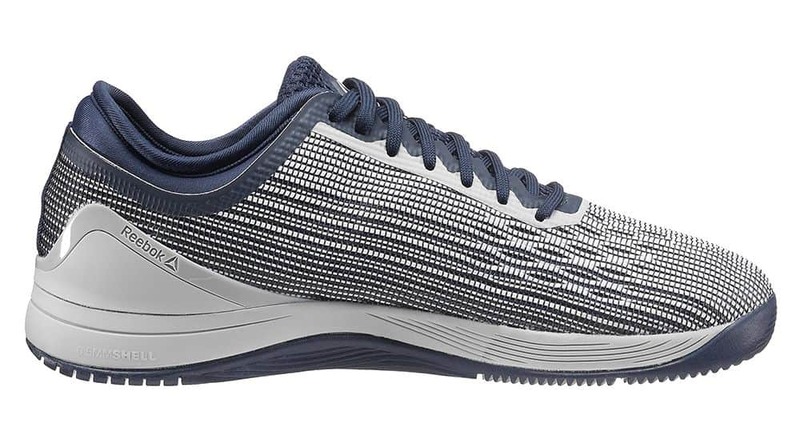 As we mentioned above, the Nano is rigid enough for lifting big weights – but at the same time it’s got the flexibility and midsole cushioning needed to jump, run, or cut. 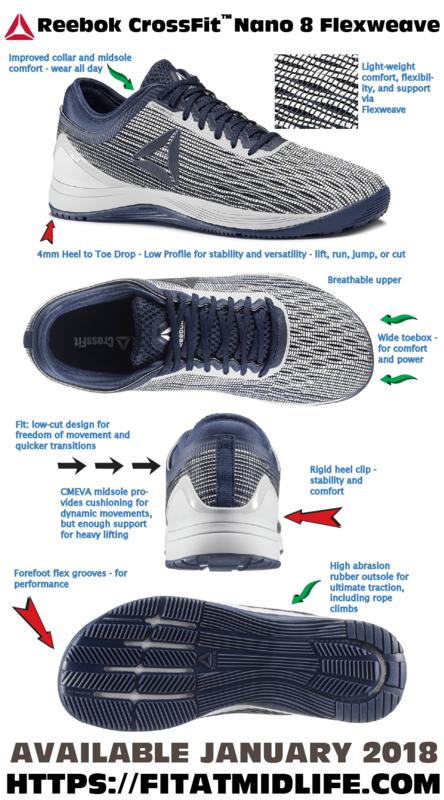 Regarding the fit – a low-cut design for freedom of movement and quicker transitions ensures you’ve got full ankle range of motion. Meanwhile the flex grooves ensure the forefoot has the flexibility needed up front. 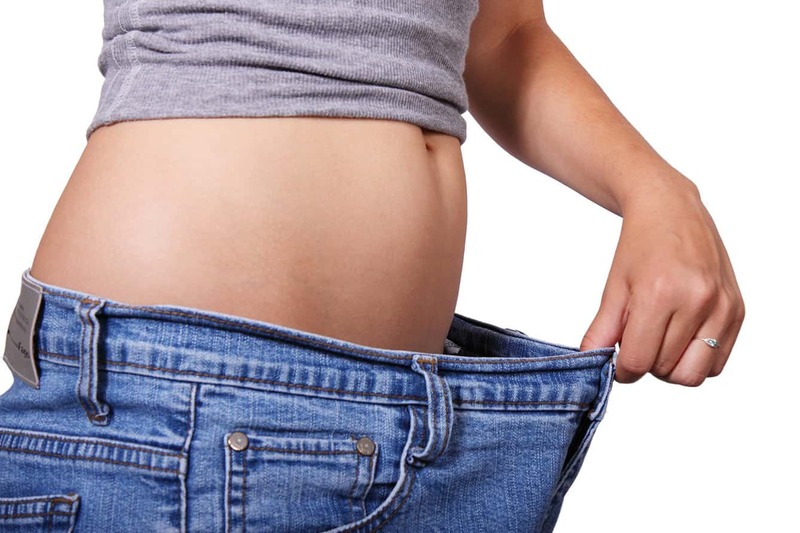 These shoes are relatively light – about 10 or 11 ounces – depending on size. Lastly, the toe box is wide for comfortable fit and powerful movements. A CMEVA moulded midsole adds cushioning – which is necessary for the dynamic movements such as jumping and sprinting. The outsole, or more simply the “sole”, is made from high abrasion rubber for traction. In the closeup photo above, you can clearly see the forefoot flex grooves as well. You can also see from the side views presented earlier that the critical area needed for traction in rope climbs incorporates the sole material as well – for traction and durability. 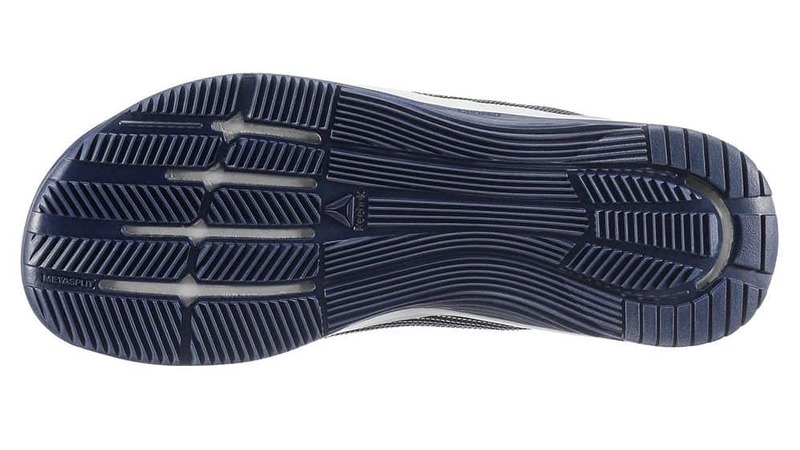 In the top view below, you can see the wide toe box – for stability and power. The collar is also evident and has been improved for all day comfort in the new model. Lastly, here’s the heel – it’s got a robust and rigid heel clip – for a stable and strong fit with a “locked-in” feel. 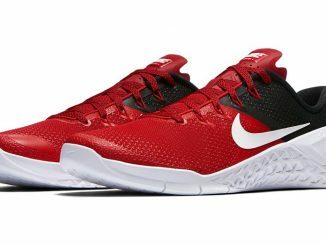 Again – this is a shoe for lifting big weight. Can I squat in Nano 8s? Yes – you can. With the minimal heel to toe drop (4 mm) there’s no significant heel raise – so you’ll need adequate flexibility in the ankles, but otherwise the rigid heel and midsole make this a great choice for squatting. You’ll be able to handle heavy weights with stability in any squat style – low bar, high bar, front squat, goblet squat, etc. Can I deadlift in Nano 8s? Yes – a flat (minimum heel to toe drop) shoe that minimizes range of motion for the deadlift is always an excellent choice for the deadlift. Again, the rigid and stable sole and mid-sole will ensure you can handle big weights without a stability issue. How about the Oly lifts? Yes – with the ankle flexibility caveat aside – these are good Oly lifting shoes. 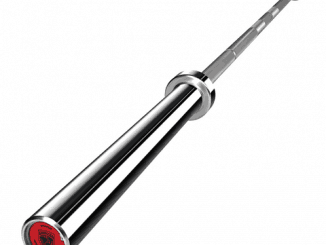 The rigidity means efficient power transfer – just what you need for the explosive lifts. The Reebok Nano 8s are one pair of shoes that do it all for the WOD – lift, jump, run, climb. The Reebok Nano 8 is an evolution of an excellent cross training shoe. It’s built for the demands of the WOD – which are various and intense. Give these shoes a try for your next workout. Dude I regularly run 1.5-3 miles in my Reebok nano 5.0’s. No problems. They just wear fast. I go through two pairs a years, with around 15-18 hours of training a week.